1. Lie on your back with your knees bent and a dumbbell in each hand. 2. 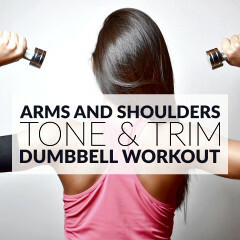 Extend your arms and position the dumbbells directly above your shoulders. 3. Bend your elbows and bring the dumbbells down until they’re close to your ears. 4. 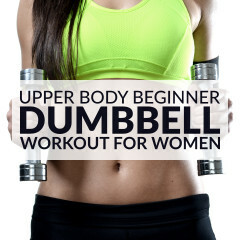 Lift the dumbbells back up and repeat the exercise. When doing the lying triceps extension, be sure to keep your upper arms stationary, only your elbow joints should move. Breathe out as you bring the dumbbells up and keep your elbows close to your body during the entire movement. The lying tricep extension strengthens your triceps, helps to sculpt your upper body and stabilizes your shoulder joint. This exercise increases the strength and range of motion of your shoulders and elbows and improves the flexibility of your arms. For a complete arm workout pair the lying tricep extension with bicep curls or hammer curls. 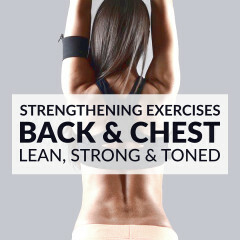 Start with 2 sets of 8 to 12 reps and pay special attention to your exercise form.